First off - Weiss shoot went extremely well. She got a little hot every now and again but as long as we kept the sun off it, there were no problems. The camera is a beast and is 100% production worthy. Robust 1080psf images from 1-2000 fps with a great toolset for fine controls. The paint, capture, record workflow is straightforward and very easy to troubleshoot. With a forthcoming firmware update, it will also be able to shoot and output sync sound frame rates, 23.98 & 29.97. Once this happens and the word gets out on how high quality the HS-2 is, I promise you will start seeing it on a lot of sets. Sync sound shots for this were believe or not, 5D mk2. I'm always amazed at where this camera turns up. Seems like these days, DP's and directors always have one in their bag and find some way to use it. What's really got me excited though is how much fun I'm having shooting stills and video with my 7D. I had today off in San Juan, Puerto Rico and I went to the old part of town which is beautiful but sleepy and tranquil. Great to sit and have a coffee while admiring the Spanish colonial architecture but not necessarily the best video subject matter. Perfect for stills though and I ended up shooting almost a whole card. By the time I got back to the hotel the sun was setting so I went down to the beach and videoed the waves, joggers, and the gorgeous sundown over the city. Everything I needed to do this fit in my small backpack. What a blast these cameras are. The Fader ND, Zacuto parts, and Superflat Picture Style are definitely the key to a good video experience. Despite some shortcomings, I don't care, at this point I'm sold on the HDSLR. I'll be posting the results of the day as soon as I have a chance to do a little editing. Also of note, I didn't know this but a certain primal, ancient, animal vs. animal sport is alive and well here. 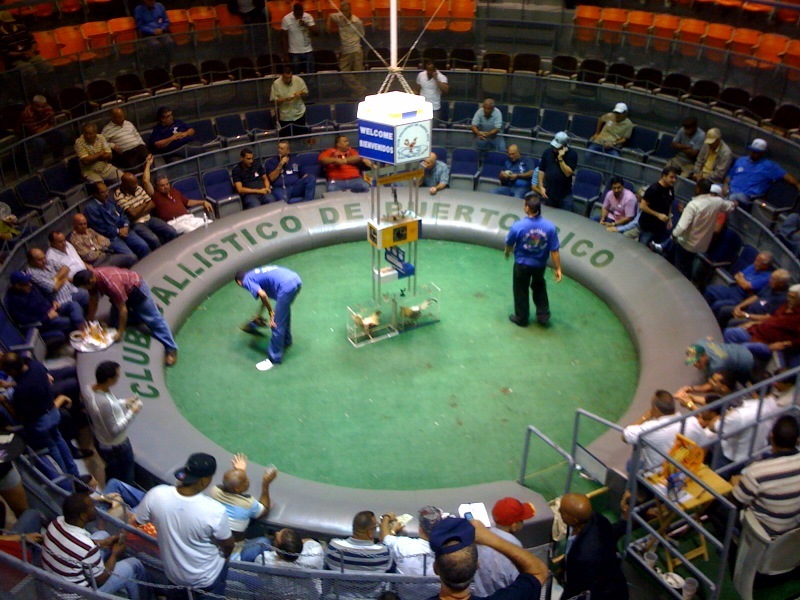 The Puerto Rican producers insisited on taking us to watch roosters eviscerate each other at a legal cockfighting venue. Definitely not my cup of tea but an interesting cultural experience nonetheless. All I could think about was how amazing it would have been to have the Weiss in that pit. Don't get me wrong, I'm not advocating this legal but ethically questionable activity but as you can imagine it was extremely visual and honestly, perfect subject matter for high speed videography. Anyone who wants to make a doc on cockfighting in Latin America let me know. There's a fascinating culture to it. Apparently Cuban-Americans in Miami raise the best birds but they obviously can't fight them there so when they take them to the ring in Puerto Rico, it's a big deal for the cockfight aficionados. How you get a fighting chicken onto an airplane I have no idea.. Is this not a documentary waiting to happen? You don't take a big camera out at a place like this unless you'd like a shiv to the kidney.